Emergency landing drills at the helm of a Sea King helicopter… a search and rescue demonstration… these activities included in the Royal Tour showcased Canadian expertise and underscored Prince William’s keen interest in maritime rescue. This prompted the Canadian War Museum to conduct a search operation of its own – through its sea of military treasures. For their first official function following their engagement, Prince William and Miss Catherine Middleton took part in the christening of a lifeboat at Trearddur Bay in northern Wales. As a Royal Air Force helicopter rescue pilot, the Prince knew full well how the sea can spell peril for those lost upon it. June 24, 1944: Royal Canadian Air Force Flight – Lieutenant David Ernest Hornell, first pilot and captain of a twin-engine amphibious aircraft, is engaged on an anti-submarine patrol in northern waters north of the Shetland Islands. Spotting an enemy submarine, Hornell prepares to attack, but his plane is spotted and damaged by the U-Boat’s anti-aircraft fire. Nonetheless, he maneuvers his disabled craft to very low altitude and releases his depth charges. The submarine is hit and sinks within minutes. Hornell, with great skill and steely resolve, manages to land his flaming aircraft on the choppy seas. But the crew suffers a stroke of bad luck – the only serviceable life raft cannot hold all the men. They would have to take turns in the icy water, holding onto the sides of the dinghy. After a wait of some hours, hope is rekindled: an Allied plane drops a lifeboat…but it unfortunately lands some 500m downwind. Hornell, already nearing exhaustion, proposes to swim to the craft but is restrained by crew members with considerable difficulty. It is not until the next day, after 21 hours at sea, that help finally arrives in the form of a British rescue boat. Two of the eight men have already perished, and Hornell dies just 20 minutes after the rescue. For his courage and determination, Flight-Lieutenant David Ernest Hornell is posthumously awarded the Victoria Cross. This moving story illustrates the sort of difficulties that have long bedeviled search and rescue operations. Today, our Sea King helicopters can hover just above the waves and even land on water – sometimes even with a Prince at the controls – but what were marine rescues like during World War II? In exploring the hidden treasures of the Canadian War Museum’s collection, we find a scaled-down version of the airborne lifeboat that almost saved Hornell’s crew. The craft, a replica of those used by Canadian and British forces, demonstrates the ingenuity that was built into lifesaving equipment. In the first years of the war, crews that had to ditch their aircraft at sea had to settle for the precarious aid of airdropped inflatable dinghies and food. Survival times under such conditions were limited. 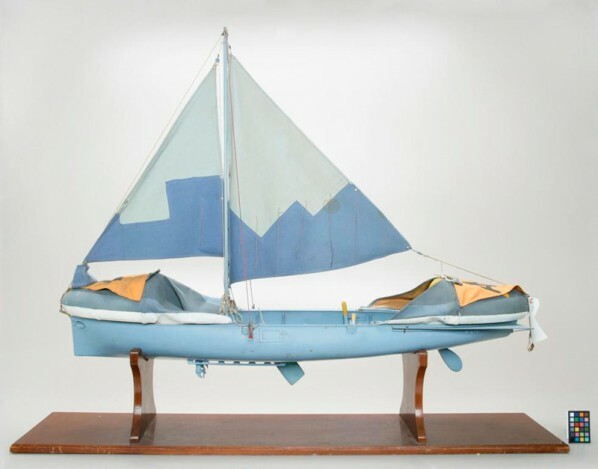 Uffa Fox, a builder of small sailboats whose stepson had been taken prisoner at sea, set out to develop a sturdy, airborne lifeboat that was both reliable and well-equipped. The craft, some 9.5m long, was attached below a bomber that would drop it as close as possible to the victims in the water. Parachutes controlled its descent and floating cables 70m in length, deployed by rockets, helped victims reach the craft. Once aboard, the rescued crew would find all the necessary equipment for prolonged survival at sea: compass, flare gun, water and food rations. Sails could also be unfurled, and the boat even contained an instruction booklet for novice sailors. Although the craft that was meant to save Flight Lieutenant Hornell fell short of its mark, countless other victims survived thanks to airborne lifeboats. The model conserved by the Canadian War Museum bears witness to the perils of war – and to the valiant efforts made by search and rescue crews.